Our blog gives you updates on what's happening in Split, from a uniquely individual point of view. As well being the gateway to the islands of Dalmatia, Split is a vibrant and fascinating city in its own right and our apartment is perfectly placed to take advantage of it. The narrow streets of Split’s historic central area are lined with ancient palaces, museums, old houses, cafes, restaurants, and shops, while the nearby Marjan hill offers a huge area of forest, dotted with beaches and coves. Further afield there are a number of towns, cities and natural beauties worth exploring. Split’s tourist information website has lots of useful information on the city – including a calendar of events, places to see, exchange rates, the current weather, and a webcam – but here is our own take on the sights worth seeing and things worth doing. Right in the middle of the palace itself is the public square which in Roman times was where the Emperor’s quarters met the public areas. Today, Peristil is a place where people come to marvel at the architecture, take a coffee, buy a trinket, listen to music or even, on certain nights, to dance. On one side of the Peristil is the cathedral of St Domnius (known locally as Sveti Duje) the building having originally been the mausoleum of Diocletian. Despite its tall bell tower it is easy to see its Roman heritage, not least because of the plundered Egyptian relics surrounding it. On the opposite side of the square is the Cafe Luxor, occupying a former Renaissance palazzo, beside which a tiny alley leads to the small but charming Temple of Jupiter. Between the cathedral and the Luxor is the Vestibule, which at the first floor level gives access to the buildings that once formed the Emperors private quarters, while some steep steps lead down to the palace basements where you will find stalls selling artwork and tourist momentos. Split’s main market – the Pazar – butts up against the east wall of the palace where its horse track, the Hippodrome, once was. A classic market, Pazar serves up everything that local people and tourists alike could want. At the Riva end of the market are stalls selling tourist goods and clothes, along with a market for plants and fresh flowers. Further up is the ‘green market’ where farmers and gardeners from all over the area come, set up a stall, and sell their home grown fruit & veg or their home produced cheeses, smoked meats and honeys. These stalls are overlooked by permanent shops selling bread, pastries, meat and cheeses. The north end of the market has more such shops, along with stalls selling home wares and clothes. On the side of the palace closest to the apartment is the square called Narodni Trg (known locally as Piaca). This was the first area of expansion beyond the palace and still houses the fifteenth century town hall and one or two other medieval buildings, sitting side by side with later, but still old, properties. Pjaca is known as a place where people, particularly the older generation, meet up for a coffee. The palm tree lined ‘Riva’ waterfront is the perfect place to enjoy a drink while watching Split’s beautiful people stroll by. With Diocletian’s Palace behind you and a view across to the islands of Brač, Hvar, and Solta, the Riva is hard to beat as a spot to while a few hours away. There is something special about the narrow streets of Varoš that is difficult to put a finger on. 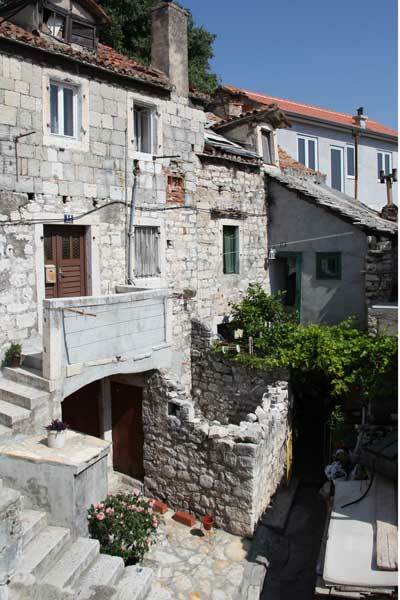 It may be the old stone buildings, some in good repair and others not so, or the fact that it is very much a working area inhabited by Croatians rather than the multi-national hubbub of Grad just a few streets away. But whatever it is, Varoš has its own character and will repay a wander around it. This perfectly formed little 11th century church sits tucked away in its own small square. Romanesque in style, it is often open to visitors during the summer. The street the apartment is in ‘Palmina Ulica’ is thought to have been renamed after the second world war in honour of local resistance heroine Palmina Piplović. Aged only sixteen, Palmina was killed by the Nazis in 1944. A memorial to her is on the wall of a house down a small alley where Palmina meets Senjska. If Grad is Split’s heart, Marjan is it’s soul. This hilly, tree covered peninsula, which rises just behind the apartment, is a 600 acre conservation area dotted with ancient churches, superb views over the city and great beaches, as well as being ideal for walking and biking. On the eastern slopes of the Marjan, just above the city, is the small, early thirteenth century church of St. Nicholas (Sv. Nikole). It’s no surprise that with its beautiful outlook across the water to the islands of Hvar and Solta that the church is dedicated to the sailors who ply the Adriatic. 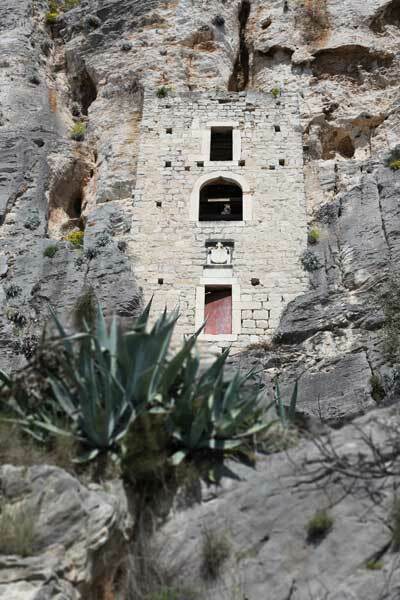 Two and a half kilometres further along the path that runs along the south rim of Marjan is the fifteenth century church of St Jerome (Sv. Jeronima). This features an equally lovely view over the islands and makes for a cool, quiet stop on any walk across the Peninsula. The church has an altar carved by Andrija Aleši. Built into clefts in the cliffs directly above and behind St Jerome are a group of Renaissance hermitage caves, first used in the fifteenth century. Although not open for visits, it is easy to get a sense of what it might have been to be a religious hermit six hundred years ago. The inhabitants of Split have made pilgrimage to St Jerome since the early thirteenth century, possibly hoping to catch a glimpse of the self-exiled hermits! Back near the apartment, and next to the Videlica cafe bar which has superb views over the city, is the Split’s old Jewish cemetery. First established in 1573, the cemetery has over 700 graves, with readable tombstones from the eighteenth to twentieth centuries, the last burial taking place in 1945 when it was closed and protected as a monument. At one time Split had a sizeable Jewish population and it’s synagogue is one of the oldest in Europe still in use. Thought by many to be one of the greatest sculptors of religious subjects since the Renaissance, Meštrović was apprenticed to a Split master stone cutter and went on to become the first living person to have a one man show at the Metropolitan Museum of Art in New York City. Hi villa is now a gallery devoted to his work and it’s quiet location makes it a beautiful spot to appreciate the work on display. Split has something for everyone when it comes to beaches. The lively Bačvice beach, with its imported sand and wide range of bars and cafes attracts all those who want to see and be seen, or who want to play Glavomet or Picigin. Bačvice is a 10-15 minute walk from the apartment. 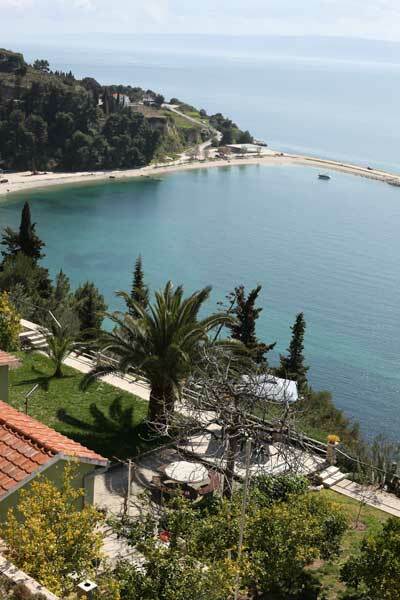 However, most Splicanis think that the Marjan has the best beaches for swimming and sunbathing. These range from wide pebble beaches such as Kašjuni on the south side, to small un-named rocky coves on the north shore. The closest beaches on the south side can be reached on foot in 15-20 minutes or in minutes by using the regular bus service. Our map of Split’s beaches shows where each is in relation to the apartment. Many of our guests stay at the apartment en route, or returning from, the Dalmatian islands. The better known are Brač, Hvar, Vis, and Korčula, but there are a number of smaller ‘Otok’ such as Lastovo. Brač, with its rock ruggedness, makes a worthwhile day trip at any time of year due to the many daily ferry sailings, while Hvar’s quaint Starigrad and impressive Hvar town can be visited in a day during the summer months. 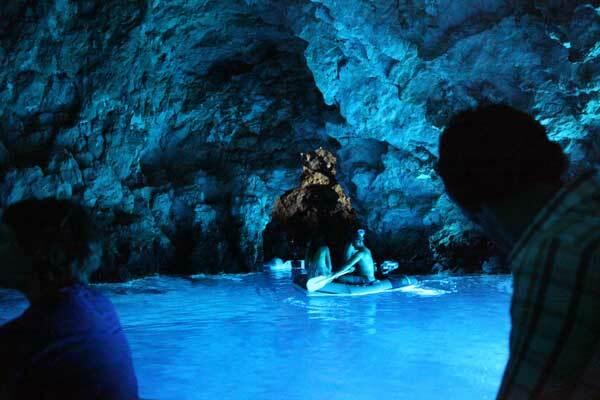 Korčula has a wonderful Venetian old town well worth seeing on a longer excursion and on Vis the charming village of Komiža has a relaxed pace and affords access to the Blue Cave on the nearby small island of Biševo. Only a bus ride away from Split is the quaint old city of Trogir, a UNESCO World Heritage site full of narrow alleys and Venetian architecture. By car it is also easy to reach a number of charming and historic coastal towns such as Primošten and Šibenik. 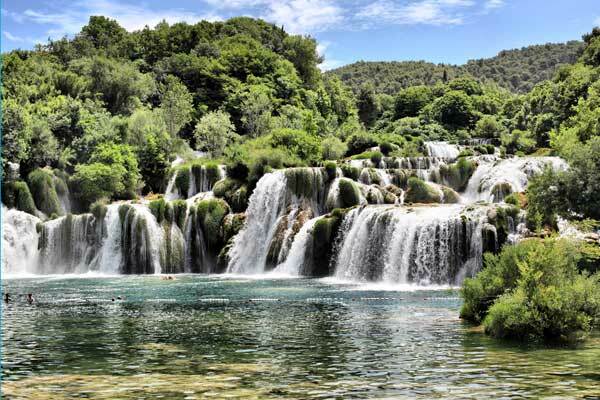 Near the latter is the Krka Falls National Park where spectacular waterfalls race down a natural ravine. 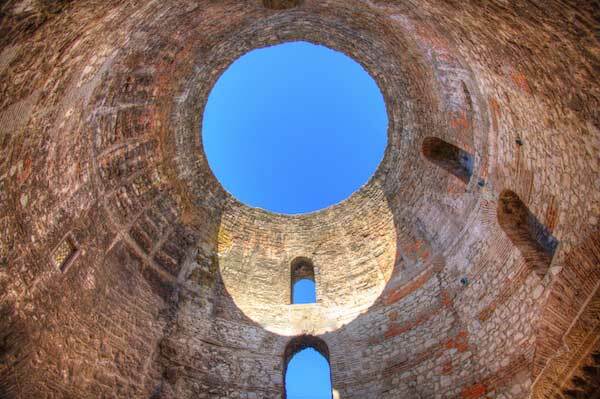 Our agent in Split runs day coach excursions to Krka. Further afield, the world heritage city of Dubrovnik can also be seen on a day trip using the fast inter-city coach service.